#1. This week's number one is U21 international point guard Caio Pacheco (190-99, currently plays in Argentina). He led Bahia Basket to a surprising victory over the second-ranked San Lorenzo (11-1) 82-78 in the Argentinian La Liga in Friday night's game. Pacheco was MVP of the game. He scored 15 points and added 4 passes in 20 minutes on the court. Bahia Basket (4-10) is placed 17th in the La Liga. This year Pacheco averages: 5.8ppg, 2.4rpg, 2.8apg, 2FGP: 39.3%, 3FGP: 29.2% in eight games he played so far. He is currently a member of the Brazilian U21 national team. #2. Second place goes to an experienced international point guard Marcelinho Huertas (191-83, currently plays in Spain). He could not help one of league's weakest teams Baskonia (14-6) to beat Real Madrid (15-5). Huertas scored 8 points in only 12 minutes. 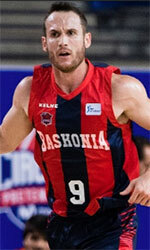 Baskonia lost 76-82 on the road to the second-ranked Real Madrid. This year Huertas' overall stats are: 7.7ppg, 2.4rpg, 4.8apg, 2FGP: 54.3%, 3FGP: 37.5% in 20 games. He has a dual citizenship: Brazilian and Italian. Huertas is in the roster of the Brazilian senior national team. #3. The Brazilian player who performed third best last week abroad was former international small forward Bruno Caboclo (206-95, currently plays in NBA). He was not able to help the Memphis Grizzlies (23-34) in their last game on Thursday. Despite Caboclo's very good performance the Memphis Grizzlies (23-34) were crushed 117-95 in Oklahoma City by the Thunder. He was the second best scorer with 16 points. Caboclo also added 5 rebounds. Caboclo's total stats this season are: 6.3ppg, 3.1rpg, 1.2bpg, 2FGP: 53.3%, 3FGP: 25.7%. He played for the Brazilian national team two years ago. #4. Center Hatila Passos (211-85, college: N.Mexico St., currently plays in Uruguay) contributed to a 1-point Malvin's victory against the sixth-ranked Olimpia (16-9) 89-88 in a derby game in the Uruguayan LUB last Tuesday. Passos recorded 10 points and grabbed 7 rebounds in 32 minutes. Malvin Montevideo (19-6) is placed first in the LUB. It was his team's third consecutive victory in a row. They will play only one more game in the Regular Season. And that game will be critical. Passos has relatively good stats this year: 11.4ppg, 10.3rpg and 1.2apg in 21 games. He is another player who holds two passports: Brazilian and Uruguayan. Passos used to play for the Brazilian national team back in 2010. #5. International point guard Rafael Freire Luz (188-92, agency: Interperformances, currently plays in Spain) was not able to secure a victory for Andorra (10-10) in their game against Movil Estudiantes (8-12) in the Spanish Liga Endesa. He scored 6 points and grabbed 5 rebounds. Andorra was edged 91-90 in Madrid by the lower-ranked Movil Estudiantes (#12). They ended the series of four consecutive victories. It's Freire Luz's first season with the team. Freire Luz's total stats this year are: 4.5ppg, 2.7rpg, 2.3apg and 1.4spg. He has both Brazilian and Spanish nationalities. Freire Luz plays currently for the Brazilian national team. #6. Center Lucas Siewert (202-97, currently plays college basketball in the States) led Colorado to a victory against the University of Southern California (1-5) 69-65 in the NCAA on Saturday night. Siewert scored 12 points and grabbed 6 rebounds in 22 minutes. The University of Colorado has 1-4 conference record this season. This year Siewert has relatively solid stats: 11.3ppg, 5.1rpg and 1.3apg in 23 games. He is a former U18 international player as he played for the Brazilian team five years ago. #7. International center Augusto Lima (206-91, currently plays in Spain) contributed to Burgos' shocking victory against the fifth-ranked CB Canarias (12-8) 88-83 in the Spanish Liga Endesa in Sunday night's game. Lima scored 9 points and grabbed 5 rebounds. San Pablo Inmobiliaria Miraflores Burgos (8-12) is placed 13th in the Liga Endesa. Lima's total stats this season are: 6.1ppg and 4.7rpg. He is also Brazilian national team player. #8. Power forward Cristiano Felicio (206-92, college: Oregon, currently plays in NBA) couldn't help the Chicago Bulls (13-44) in their game against the Washington Wizards (24-33) in the NBA. Felicio recorded 5 points and grabbed 5 rebounds in 12 minutes. The Chicago Bulls (13-44) lost 125-134 in Washington to the Wizards. This year Felicio's total stats are: 3.1ppg and 2.8rpg in 35 games. He used to play for the Brazilian national team back in 2016. #9. Former international point guard Raul Neto (185-92, currently plays in NBA) managed to help Utah Jazz to win against the San Antonio Spurs (32-26) crushing them 125-105 in the NBA on Saturday night. Neto recorded only 4 points and added 5 assists. The Utah Jazz has 32-24 record this season. Neto has been at the team for four years. He has averaged so far 4.8ppg, 1.5rpg and 2.2apg. Neto used to play for the Brazilian national team three years ago. #10. Forward Tulio Da Silva (201-96, currently studies in the States) contributed to a 1-point Missouri St.'s victory against the Illinois State University (3-3) 66-65 in the NCAA in Sunday night's game. He scored 17 points and grabbed 7 rebounds in 32 minutes. The Missouri State University has not so impressive 2-4 conference record this season. Da Silva has reliable stats this year: 14.6ppg and 7.0rpg in 19 games. He is a former U18 international player as five years ago he still played for the Brazilian national team. #11. International shooting guard Vitor Benite (192-90, currently plays in Spain) is a teammate of previously mentioned Augusto Lima and both played together in the last Spanish Liga Endesa game. Benite contributed to Burgos' shocking victory against the fifth-ranked CB Canarias 88-83. He scored 8 points. Benite averaged so far 11.8ppg and 2.1rpg. He plays currently for the Brazilian national team. #12. Former international center Nene Hilario (211-82, currently plays in NBA) couldn't help the Houston Rockets in their game against the Oklahoma City Thunder in the NBA. Hilario cannot count Saturday's game as one of the best ones. He recorded only 2 points and had 3 steals in 17 minutes. His team lost 112-117 in the NBA. Hilario has averaged so far 3.9ppg and 3.1rpg in 27 games. He used to play for the Brazilian national team back in 2016. #13. Former U18 international center Dida Pereira (202-92, college: Sequoias CC, currently plays in Chile) contributed to an easy victory against the fifth-ranked CD Castro crushing them 100-68 in the Chilean Liga Nacional in Wednesday night's game. Pereira recorded 7 points and grabbed 12 rebounds in 37 minutes. Pereira has individually a very good year with high stats. He averages: 17.1ppg, 8.5rpg and 1.5apg in 25 games. Pereira used to play for the Brazilian U18 national team nine years ago. #14. Former U19 international forward Dimitris Sousa (198-94, college: Virginia-Wise, currently plays in Italy) was the major contributor in a Moncada AGR's victory against the 16th-ranked Virtus Cassino 75-69 in the Italian Serie A2 (second division) last Sunday. He scored 14 points and grabbed 6 rebounds. Sousa has averaged so far 8.8ppg and 3.1rpg. He used to play for the Brazilian U19 national team back in 2009. #15. Former U18 international forward Rafael Monteiro (193-98, currently plays in NCAA2) contributed to an easy victory against the Columbus State University 87-68 in the NCAA2 on Saturday night. Monteiro recorded 16 points and grabbed 4 rebounds in 21 minutes. Monteiro averaged so far 14.0ppg, 5.9rpg and 1.2apg in 18 games. He used to play for the Brazilian U18 national team three years ago. #1. Pedro Ianguas (208-C-98, currently plays in Argentina). Ianguas could not help Bahia Basket (4-10) to beat Quimsa (9-5). He scored 9 points. But Bahia Basket was defeated 94-83 on the road by the much higher-ranked Quimsa (#5). Ianguas' overall stats this season are: 5.2ppg and 4.5rpg. #2. Oscar Da Silva (207-PF-98, currently plays college basketball in the States) led Stanford to an easy victory against the Oregon State University crushing them 83-60 in the NCAA in Thursday night's game. He scored 23 points, had 9 boards, handed out 7 passes and blocked 2 shots in 37 minutes. The Stanford University has rather weak 2-4 conference record this season. This year Da Silva's total stats are: 10.0ppg, 5.7rpg, 1.9apg and 1.2bpg in 22 games he played so far. He has a dual citizenship: German and Brazilian. Despite Da Silva's Brazilian passport, he previously played for the German U19 national team and is probably not eligible to play for the Brazilian team. #3. Diego Soarez (205-C-87, currently plays in Uruguay) contributed to Hebraica's victory against the tenth-ranked Bigua (11-14) 77-69 in a derby game in the Uruguayan LUB last Tuesday. Soarez recorded 6 points and grabbed 5 rebounds. Hebraica Macabi Montevideo (1-8) is placed third in the LUB. It was his team's third consecutive victory in a row. They will play only one more game in the Regular Season. And that game will be critical. Soarez's total stats this season are: 4.3ppg and 3.5rpg. He is another player who holds two passports: Brazilian and Uruguayan. #4. Gabriel Da Silva (206-C-96, currently plays in Argentina) managed to help Quimsa Santiago del Estero to win against one of league's weakest teams Argentino (3-11) 93-81 in the Argentinian La Liga in Saturday night's game. Da Silva scored only 2 points. Quimsa Santiago del Estero (8-6) is placed fourth in the La Liga. Da Silva has averaged so far 1.0ppg and 1.5rpg. #5. Experienced Kazuya Hatano (192-F-82, currently plays in Japan) was not able to help Fukuoka Rizing in their game against Yokohama BC (11-29) in the Japanese B League. He scored 8 points in only 13 minutes. The fifth-placed Fukuoka Rizing (10-30) lost 77-85 at home to the lower-ranked (#6) Yokohama BC in the West group. It was Fukuoka Rizing's sixth consecutive loss in a row. Hatano has averaged so far 2.3ppg and 1.4rpg in 34 games. He has both Brazilian and Japanese nationalities. Despite Hatano's Brazilian passport, he previously played for the Japanese U22 national team and probably cannot be called to the Brazilian team. #6. Ayan Carvalho (196-G/F-97, college: Temple, currently plays in Argentina) contributed to a Deportivo Viedma's victory against the second-ranked Rocamora 80-66 in the Argentinian La Liga Argentina (second division) on Thursday night. Carvalho recorded 9 points, 7 rebounds and 3 assists. Carvalho has averaged so far 8.3ppg, 4.0rpg and 1.3apg. He also holds two passports: Brazilian and Argentinian. Despite Carvalho's Brazilian nationality, he previously played for the Argentinian university national team. #7. Luis Rossi (193-F, currently plays in NAIA) was not able to secure a victory for the St. Andrews University in their last game on Wednesday. Despite Rossi's good performance his team was defeated 78-73 in Cleveland by the Truett-McConnell College. He recorded 10 points and grabbed 9 rebounds. Rossi averaged so far 14.0ppg, 5.9rpg and 1.2apg. #8. Masa Swain (190-G, currently plays in NCAA2) helped Chaminade University win their game against the Hawaii Pacific University 92-85 in a derby game in the NCAA2 on Monday night. He scored only 4 points and had 3 steals. Swain has averaged so far 3.9ppg and 1.9rpg. He is a naturalized American. Strangely Swain has never played in Brazil. #9. Matheus Maciel (207-C-1, currently plays in Spain) was the major contributor in Unicaja-Andalucia's victory against the fourth-ranked Andujar 82-70 in the Spanish EBA (fourth division) in Saturday night's game. He scored 11 points and grabbed 4 rebounds in 22 minutes. Maciel has averaged so far 6.8ppg and 5.6rpg in 17 games. #10. Lucas Doria (203-F-97, currently plays in NCAA2) helped St. Edward's University win their game against the Newman University 82-67 in the NCAA2 last Saturday. He recorded 6 points. Doria has averaged so far 7.7ppg and 4.8rpg. Flamengo outscored Corinthians to sweep the series. Flamengo dominated down low during the game scoring 48 of its points in the paint compared to Corinthians' 24. The best player for the winners was the former international Marquinhos Vieira (207-84) who scored 15 points, 6 rebounds and 4 assists. The former international forward Olivinha Rodriguez (203-83) chipped in 17 points and 6 rebounds. At the other side the best for losing team was Uruguayan point guard Luciano Parodi (182-94) who recorded 13 points, 5 rebounds and 7 assists and the former international Guilherme Teichmann (206-83, college: Tulsa) added 6 points, 9 rebounds and 5 assists respectively. The winner was already known earlier in the game, so both coaches allowed to play the bench players saving starting five for next games. Pinheiros held off Botafogo to ensure 2-1 advantage. Pinheiros shot the lights out from three nailing 17 long-distance shots on high 63.0 percentage. Their players were unselfish on offense dishing 22 assists. It was a good game for the former international Betinho Nardi-Duarte (195-88) who led his team to a victory with 23 points, 5 rebounds and 5 assists. The former international forward Marcus-Vinicius Toledo (201-86) contributed with 11 points and 4 assists for the winners. Forward Arthur Bernardi (206-90, college: Houston Baptist) answered with 13 points and American point guard Jamaal Smith (175-85, college: N.Mexico) added 11 points and 4 assists in the effort for Botafogo F.R.Since the result was very predictable, it gave the chance for the coaches to test many bench players which allowed the starters a little rest for the next games. Mogi rallied past B.Caerense to complete the sweep. It was a good game for naturalized American Shamell Stallworth (195-80, college: USF) who led his team to a victory with 26 points, 6 rebounds and 6 assists. The former international guard Guilherme Pereira (190-91) contributed with 15 points, 5 rebounds and 4 assists for the winners. Mogi's coach Jorge Guerra allowed to play the deep bench players in such tough game. Naturalized Italian point guard Paulinho Boracini (183-84) answered with 14 points, 5 rebounds and 4 assists and the former international forward Felipe Ribeiro (201-79) added 10 points and 8 rebounds in the effort for SKY/Basquete. Five SKY/Basquete players scored in double figures. Franca advanced into the semifinal stage as they cruised past Bauru. Vivo/Franca made 16-of-20 charity shots (80.0 percent) during the game. Vivo/Franca outrebounded Paschoalotto/Bauru 38-26 including 29 on the defensive glass. Their players were unselfish on offense dishing 24 assists comparing to just 11 passes made by Paschoalotto/Bauru's players. It was a good game for international forward Lucas Silva (209-95) who led his team to a victory with 22 points and 7 rebounds. 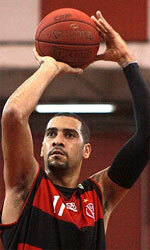 American David Jackson (195-82, college: Penn St.) contributed with 14 points and 7 rebounds for the winners. Vivo/Franca's coach Helinho Garcia felt very confident that he used 11 players which allowed the starters a little rest for the next games. The former international power forward Lucas Mariano (208-93) answered with 12 points and 6 rebounds and the former international point guard Fulvio de-Assis (188-81) added 16 points in the effort for Paschoalotto/Bauru. #1. This week's number one is an experienced international point guard Marcelinho Huertas (191-83, currently plays in Euroleague). He could not help Baskonia (15-15) to beat CSKA (23-7). Huertas recorded 5 points in 19 minutes on the court. Baskonia was crushed 94-68 on the road by the second-ranked CSKA. This year Huertas averages: 7.8ppg, 1.5rpg, 4.7apg, 2FGP: 53.7%, 3FGP: 45.1%(23-51) and FT: 87.8% in 32 games he played so far. He has a dual citizenship: Brazilian and Italian. Huertas is currently a member of the Brazilian senior national team. #2. Second place goes to an international center Augusto Lima (206-91, currently plays in Spain). He was the major contributor in Burgos' victory against the closely-ranked Movil Estudiantes (10-17) crushing them 102-82 in the Spanish Liga Endesa last Sunday. Lima recorded 12 points and grabbed 5 rebounds. San Pablo Inmobiliaria Miraflores Burgos (13-15) is placed 11th in the Liga Endesa. It's Lima's first season with the team. His overall stats this year are: 7.6ppg, 5.3rpg, 2FGP: 65.7%(46-70). Lima is in the roster of the Brazilian senior national team. #3. The Brazilian player who performed third best last week abroad was an international shooting guard Vitor Benite (192-90, currently plays in Spain) is a teammate of previously mentioned Augusto Lima and both played together in the last Spanish Liga Endesa game. Benite led Burgos to an easy victory against the closely-ranked Movil Estudiantes (10-17) crushing them 102-82. He recorded 12 points in a mere 19 minutes. Benite has relatively good stats this year: 11.2ppg, 2.1rpg, 3FGP: 41.0% and FT: 77.3% in 16 games. He is also a member of the Brazilian senior national team. #4. Center Hatila Passos (211-85, college: N.Mexico St., currently plays in Uruguay) led Malvin to a victory against the fifth-ranked Urunday Universitario (2-3) 74-68 in a derby game in the Uruguayan LUB last Tuesday. He had a double-double by scoring 11 points and getting the same number of rebounds in 32 minutes. Malvin Montevideo (4-1) is placed first in Places 1-6 group. It was his team's eighth consecutive victory in a row. This year Passos has relatively solid stats: 10.7ppg, 10.2rpg and 1.5apg in 32 games. He is another player who holds two passports: Brazilian and Uruguayan. Passos used to play for the Brazilian national team back in 2010. #5. International point guard Rafael Freire Luz (188-92, agency: Interperformances, currently plays in Spain) was not able to help one of league's weakest teams Andorra in their game against Zaragoza (14-13) in the Spanish Liga Endesa. He recorded only 4 points and added 6 passes. Andorra was edged 99-97 at home by the higher-ranked Zaragoza (#8). It was Andorra's third consecutive loss in a row. Freire Luz's overall stats this season are: 5.5ppg, 2.5rpg, 2.5apg and 1.3spg. He has both Brazilian and Spanish nationalities. Freire Luz plays currently for the Brazilian national team. #6. Forward Leonardo Demetrio (208-94, currently plays in Spain) was not able to secure a victory for RETAbet BB (22-10) in their game against CB Granada (19-13) in the Spanish LEB Gold (second division). He scored only 4 points and grabbed 6 rebounds in 21 minutes. RETAbet BB was edged 72-70 in Granada by the lower-ranked (#7) CB Granada. They ended the series of six consecutive victories. There are only two games left until the end of the Regular Season. So now every game will be critical. This year Demetrio's overall stats are: 8.1ppg and 5.1rpg in 28 games. He is a former international player as he played for the Brazilian senior team three years ago. #7. Former international small forward Jonathan Tavernari (197-87, college: BYU, currently plays in Italy) contributed to a Givova Scafati's victory against the 15th-ranked Virtus Cassino (2-26) 93-83 in the Italian Serie A2 (second division) in Saturday night's game. Tavernari scored 20 points and grabbed 5 rebounds. Givova Scafati Basket (14-14) is placed 11th in West group. The Regular Season already ended. Tavernari's total stats this season are: 8.4ppg and 3.2rpg. He used to play for the Brazilian national team nine years ago. #8. Point guard Raul Neto (185-92, currently plays in NBA) couldn't help the Utah Jazz (50-32) in their game against the Houston Rockets (53-29) in the NBA. Neto cannot count Wednesday's game as one of the best ones. He scored only 2 points in 5 minutes on the court. The Utah Jazz (50-32) was badly defeated 118-98 on their home court in Salt Lake City by the Rockets. Neto has been at the team for four years. This season Neto's total stats are: 5.0ppg, 1.6rpg and 2.4apg in 40 games. He used to play for the Brazilian national team back in 2016. #9. Former U19 international power forward Wesley Sena (210-96, currently plays in Spain) couldn't help CB Prat (8-24) in their last game. Despite Sena's good performance CB Prat lost 68-77 in Madrid to the higher-ranked (#14) Real Canoe. He scored 10 points in 26 minutes. There are only two games left until the end of the Regular Season. So now every game is very crucial. Sena has averaged so far 8.0ppg and 4.5rpg in 30 games. He used to play for the Brazilian U19 national team six years ago. #10. Guard Carlos Cobos (193-88, currently plays in Spain) faced previously mentioned Leonardo Demetrio in the Spanish LEB Gold last game. Cobos helped CB Granada edge the second-ranked RETAbet BB (22-10) 72-70. He scored 14 points. There are only two games left until the end of the Regular Season. So now every game will be important. Cobos has averaged so far 8.3ppg, 2.4rpg and 2.3apg. He is a former international player as nine years ago he still played for the Brazilian senior national team. #1. Gabriel Da Silva (206-C-96, currently plays in Argentina). Da Silva could not help Quimsa (7-1) to beat San Lorenzo (25-3). He scored 9 points and grabbed 8 rebounds. But the league leader Quimsa was defeated 62-54 at home by the leading San Lorenzo. Da Silva's overall stats this season are: 2.1ppg and 1.8rpg. #2. Felipe Dos Anjos (218-C-98, currently plays in Spain) was the major contributor in a 2-point Melilla Baloncesto's victory against the 16th-ranked Caceres Basket (9-24) 78-76 in the Spanish LEB Gold (second division) last Saturday. Dos Anjos scored 13 points and grabbed 7 rebounds. Melilla Baloncesto (19-13) is placed fifth in the LEB Gold. It was his team's first victory after four consecutive loses. There are only two games left until the end of the Regular Season. So now every game will be critical. Dos Anjos' total stats this season are: 8.2ppg and 5.2rpg. #3. Diego Soarez (205-C-87, currently plays in Argentina) was not able to help Gimnasia LP (11-15) in their last game. Despite his good performance the sixth-placed Gimnasia LP (11-15) lost 78-89 on the road to the second-ranked Centro Espanol Plottier in the South group. Soarez was the second best scorer with 14 points. He also added 6 rebounds in 21 minutes. This year Soarez's total stats are: 8.5ppg and 4.5rpg in two games he played so far. He has a dual citizenship: Brazilian and Uruguayan. #4. Experienced Kazuya Hatano (192-F-82, currently plays in Japan) was not able to secure a victory for Fukuoka Rizing (12-48) in their game against Diamond Dolphins (33-27) in the Japanese B League. Hatano scored 6 points. The sixth-placed Fukuoka Rizing (12-48) was edged 84-83 on their home court in Fukuoka by the second-ranked Diamond Dolphins in the West group. It was Fukuoka Rizing's third consecutive loss in a row. The Regular Season already ended. Hatano has averaged so far 2.2ppg and 1.5rpg. He is another player who holds two passports: Brazilian and Japanese. Despite Hatano's Brazilian nationality, he previously played for the Japanese U22 national team and is probably not eligible to play for the Brazilian team. #5. Joao Gallina (192-SF-94, currently plays in Portugal) couldn't help CAB Madeira (13-16) in their game against Vitoria SC (11-17) in the Portuguese LPB. Gallina scored only 4 points in 22 minutes. The first-placed CAB Madeira (13-16) lost 74-79 on their home court in Funchal to the lower-ranked (#3) Vitoria SC in the Places 7-12 group. It was CAB Madeira's first loss after three consecutive victories. There are only four games left until the end of the Second Stage. Gallina has averaged so far 5.6ppg and 2.1rpg in 28 games. He has both Brazilian and Portuguese nationalities. #6. Matheus Maciel (207-C-1, currently plays in Spain) contributed to Unicaja-Andalucia's victory against the eighth-ranked Real Betis II 70-56 in the Spanish EBA (fourth division) in Saturday night's game. Maciel scored 10 points and grabbed 7 rebounds. Maciel has averaged so far 7.8ppg and 5.9rpg. #7. Feliciano Perez (210-C-90, currently plays in Argentina) contributed to a 2-point Centro Deportivo Rivadavia de Mendoza's victory against the eighth-ranked Parque Sur 76-74 in the Argentinian La Liga Argentina (second division) last Friday. He recorded 9 points and grabbed 6 rebounds in 21 minutes. Perez has averaged so far 9.2ppg and 7.8rpg in 25 games. #8. Clement Faroux (188-G-93, currently plays in France) couldn't help Recy Saint-Martin in their game against Lourdes-Tarbes in the French NM1 (third division). He scored 5 points, made 3 passes and 3 steals. His team was crushed by 28 points 92-64. Faroux has averaged so far 2.3ppg, 2.3rpg and 1.5apg. He also holds two passports: Brazilian and French. #9. Renato Ribeiro (190-F-95, currently plays in Portugal) couldn't help Dragon Force in their game against Ginasio in the Portuguese Proliga (second division), despite his very good performance in Saturday night's game. Ribeiro had a double-double by scoring 13 points and getting 10 rebounds. He also added 3 assists and 5 steals in 29 minutes. But his team lost 73-79. Ribeiro has averaged so far 7.2ppg and 4.4rpg in 20 games. #10. Kalebe Lauback (198-F-2, currently plays in Portugal) is a teammate of previously mentioned Renato Ribeiro and both played together in the last Portuguese Proliga game. Lauback couldn't help Dragon Force in their game against Ginasio. He cannot count Saturday's game as one of the best ones. Lauback recorded only one point. His team was defeated 79-73. This season Lauback averages only 1.0ppg.